I have always been known for wrapping small and large items with great style and passion, but this year I upped the ante by wrapping my garage door. This project is simple, easy to do, and will make for a festive holiday d̩cor on one of the most unexpected places. Don’t worry, the instructions allow you to use your garage door without destroying the paint or molding. Please note that although each garage door is different, they are also the same. Let me explain. My garage door is made of three hinged sections (which allow it to curve when retracting); you may find other garage doors have four or more sections. Regardless of how many you may have, the decorating process is the same. The design is to create two parallel vertical lines of ribbon, each with a bow. 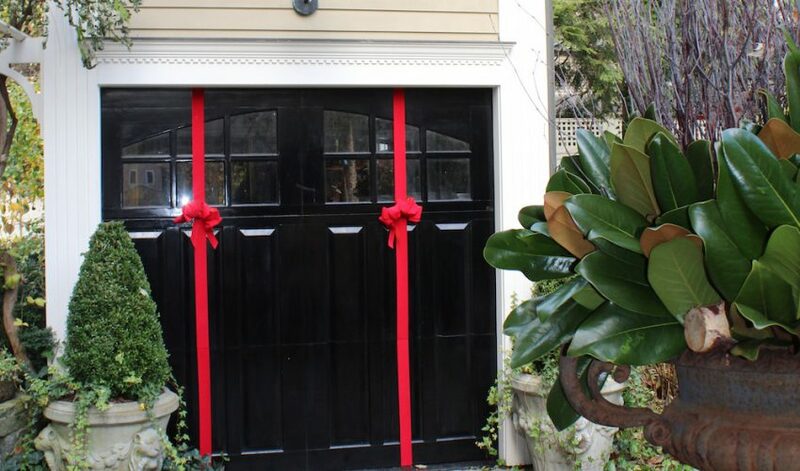 You do so by attaching sections of the ribbon to each section of the door, securing each piece out of sight (the side seen from inside the garage.) You will notice that between each section of the door there is a space or a small gap. You will slide your ribbon into here. Simply wrap the ribbon ends around the section, then secure them with a regular office stapler. Repeat for each section. If your door is large, or especially heavy, you may want to have someone help you move the door up and down when decorating it. For the top bow piece, secure your bow to the ribbon before adding this final section to the door. Keep your proportions in mind. Make your bow large enough to notice from a distance, but small enough to clear when the door opens. If your garage door is not made of wood, follow the same steps but use duck tape rather than a stapler to secure the ribbon on the back of the garage door. To reconnect your door to the automatic garage door motor, simply use your remote. Click it to open or close the door, and the mechanism in the track will automatically reattach itself to the door. You’re done! To deconstruct the decoration after the holidays, it’s easiest to remove the staples with needle nose pliers. Save time for next year by storing the pre-cut ribbon and bow. If the weather has discolored or damaged the ribbon too much to reuse it, you can still save time. Reserving even one section of ribbon means less to measure next year. This sMARt tip is so easy and fun. So, why not wrap your garage door in an unexpected style? You will love the way it looks from the street, and others will love how cleverly the door is able to open and close — with the d̩cor intact and perfect.